Size of Male: 31-40 lbs., 17-18.5 in. Size of Female: 26.5-35.5 lbs., 16-17.5 in. The Norwegian Buhund dates back to the time of the Vikings and often traveled with them on their journeys. 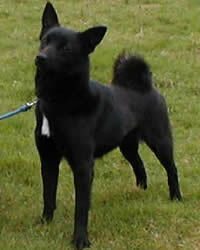 Although they are a spitz breed, the Buhund has been used as an all-purpose farm dog in Norway for centuries. Intelligent and easy to train, the Buhund makes a great companion for someone who’s active and for a family who will provide lots of exercise. Also known as the Norwegian Sheepdog, this dog breed has a long and fascinating history. Physically, they are spitz dogs with prick ears and a curled tail, but centuries ago they worked as hunting dogs, hunting bear and wolf along the western coastlands of Norway. Beloved of the Vikings, the dogs were used to herd livestock and guard farms. The Vikings often took them with them on their voyages. The dogs have been found in Viking tombs dating back to 900 A.D. The Buhund has been used steadily on farms since Viking times. The Norwegian Buhund is a self-confident dog who is very affectionate with people. They love children and they’re typically gentle. They are friendly dogs and they usually get along well with other animals. They are very active dogs and need plenty of exercise, though they are happy to rest beside you in the evening. As with many other herding breeds, the Buhund is very intelligent and they are considered easy to train. However, they do need training in order keep them out of trouble. They are alert and will bark to give warning which makes them good watchdogs. Living Environment – Buhunds do best in a large area where they have plenty of room for regular exercise. They prefer to be with their people at night. Because of their high activity level they do not make the best apartment dogs. Grooming – This dog breed is easy to brush and groom but they do shed copiously a couple of times each year. At these times they will need extra brushing to keep hair from accumulating in your home. Diet & Exercise – The Buhund has ordinary dietary requirements but they do have very high energy needs. They enjoy many dog sports such as playing ball, frisbee, flyball, obedience and agility. They need regular vigorous exercise on a daily basis. Health – The Buhund is generally a very healthy breed but they can be prone to canine hip dysplasia and dog eye problems. If you are thinking of a getting a puppy you should always talk to a breeder about possible dog health problems. When it comes to dog training, the Norwegian Buhund is considered possibly the most easily-trained of the spitz breeds. They are very intelligent dogs and they learn quickly. Since these dogs are very intelligent, dog training is recommend. Otherwise, they can find ways to entertain themselves and get into trouble if they are bored.